Lovelies, I'm really happy to announce this giveaway from Abazias, a jewelry company that specializes in really pretty diamond pieces, such as engagement rings, necklaces and bracelets. 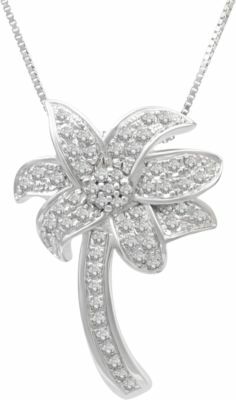 For my very first giveaway on this blog, they're offering one of my U.S. readers a beautiful diamond and sterling silver palm tree necklace. This piece is perfect for the coming warmer months, and a fun little memento of summer. I'd probably style it with a sweet floral dress, or a striped tee and skirt for a nautical theme. 2) Follow this blog (through Google Friend Connect or Bloglovin') and leave a comment. 3) For an extra way to win, leave a second comment here about your favorite piece of jewelry from Abazias' collection. The contest will end Tuesday, June 8 at 11:59 pm EST and a winner will be chosen through random.org. Be sure to check out the rest of Abazias' jewelry collection, too -- they've got tons of swoon-worthy pieces, and I think their interactive engagement ring builder is pretty nifty as well. Many thanks to Abazias for this giveaway! what a great give away! congrats on it being your first and finding such a great one! i love the Breil Stainless Steel Leaf Bangle! what a great site and prices! I checked out their website, and I am loving the White Gold Diamond Cluster Earrings. so cute! Thanks for the beautiful giveaway - I'm in and am also a long-time follower. Awesome giveaway dear. Its so beautiful !! What a pretty necklace! I follow you on Google Reader. Also, my favorite item on the Abazias site is probably the Breil Leaf Pendant! I actually love the palm tree the most, but my second favorite would be the antique floral pendant. It looks so elegant!! Pretty! I follow you on Google Reader! Fun giveaway! Congrats to you! You know I'm a follower!!! :) What a great giveaway. This necklace is a perfect everyday piece to celebrate summer! It reminds me of everything my mom has been through and fought. And she's so strong and healthy. She amazes me. Fun necklace!! I'm a US reader (although sometimes I wish I were in London) and of course I'm a follower. so cute im a new follower! What a great necklace! I'm a new follower! This is a great giveaway! The necklace is gorgeous. I'm a follower, time to come out of lurker status, lol. The Blue Topaz Center Stone and Diamond Accent Ring is BEAUTIFUL! What great prices too! I love the Pear Cut Blue Topaz and Diamond Fashion Ring. It has the right amount of bling and class. Thanks for giveaway! I like the butterfly fashion ring! I am a follower and I would definitely get the palm tree necklace out of any - since I am from the Palmetto State! :) GREAT GIVEAWAY! I like the Swirled Ring with White And Black Diamond Accents. Very cool stuff! Thanks for the chance at this awesome necklace! I love the Love Is In The Air Croc Paris Hilton watch! I am a new follower! And I think I am in love! I am drooling over the 54 in. Freshwater 8.5-9.5 mm Pearl Necklace. I have always wanted real pearls! Pretty! I'm a GFC follower. I love the Heart Shaped Puff Diamond Pendant. Too cute (and sparkly, haha). my favorite piece is the Round Cut Eternity Wedding Band ! I am a U.S. reader. Oh my gosh, I fell in love with the Deal of the Day. And that product is..."Oval Shaped Diamond Hoop Earrings." They are stunning! Awesome Giveaway :)!!! I'm a follower! I really like the website. I'd love me a tennis bracelet, hello gorgeous! I'm a new follower! Gorgeous necklace- I coudl definitely use that! I love the necklace that you're giving away but I stopped by their site... love the leaf bangle! it's modern yet you can tell exactly what it is. thanks again for hosting this great giveaway! look forward to meeting and connecting with you more in the future! What a great necklace! It totally appeals to the California girl inside of me. And I'm a follower! I love the Breil Stainless Steel Leaf Earrings! So organic but elegant! New follower! Love the site. I know a pretty momma that would love this necklace. Hands down I would get the Leaf Bangle. So chic! I love the Rose Gold Filigree Ring with Amethyst Center Stone! Glad to find you and this awesome giveaway! I am a follower on GFC! Ooo after browsing the site for a while, and dreaming a lot!, I found these Deep Burgundy Garnet Briolette Drop Earrings and fell in love! How pretty! Following now. I also love the starfish pendant. My favorite piece is the Sterling Silver Diamond Accented Key Ring Pendant. I like the 'Exclusive Murano Glass & Platinum Heart' what attracted me to it was the glitter-y color and I love hearts. ;) I also like how they have the "design your own ring" feature. Thats pretty cool.